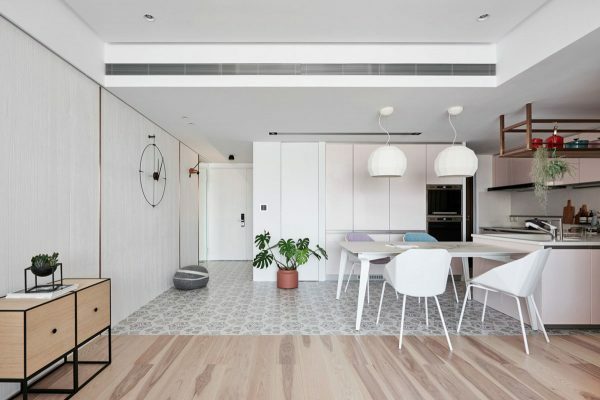 We’ve all become comfortable with seeing a bit of neutral Grey and white decor in our modern interior design schemes but sometimes for a family environment it might be nice to discover some colourful light relief. 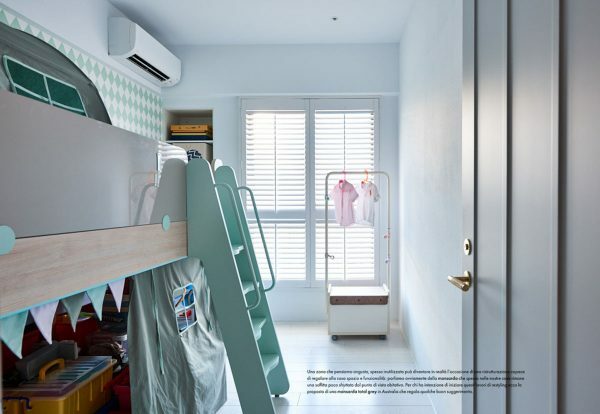 Even just a dash of subtle colour here and there makes surroundings a bit more interesting for the little ones (and us) and creates unexpected cheerful moments. 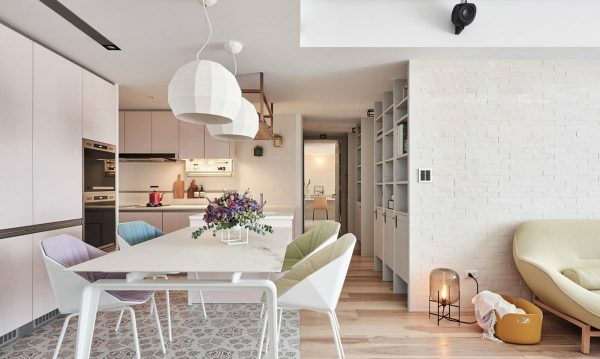 This family home was designed at the Chinese interior design studio Nordico, with Nordic style in mind. 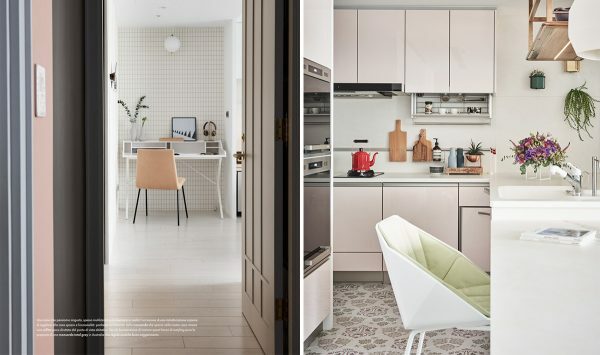 The images by Hey!Cheese Photography picks up soft powder pink, pale olive, sand, lilac and aqua tones amongst a white and chalky grey backdrop, plus Stunning Patterned Tiling. 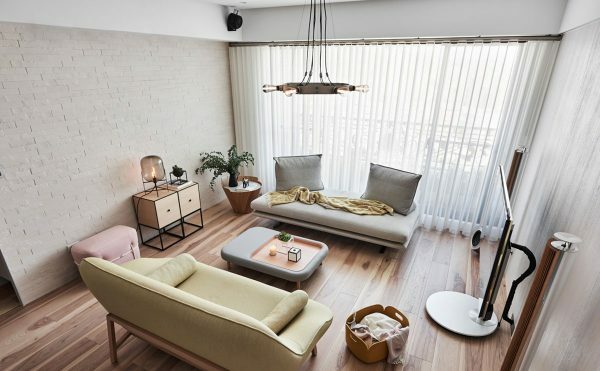 The living room is a simplistic looking space with a small modern sofa and a contemporary upholstered bench seat with a cutaway back, which lets an extra amount of natural light sneak through from the window. In front of an electrical socket, a small pink box stool shields the room from the tangle of wires. 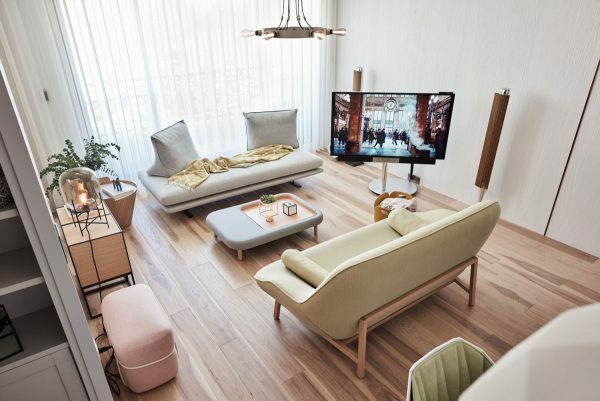 A flat screen television is mounted onto a sleek stand with a small footprint, as are the slimline speakers, in lieu of a larger console cabinet. Coffee tables are a neat place to display a few decorative items and provide a steady area to set down drinks and snacks. The one pictured here is an upholstered design that has a wipe-clean tray sunken into its surface. 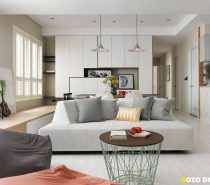 Due to the small scale nature of this furniture, the room becomes a versatile space with many layout possibilities. Here we see the two settees pushed together in an L-shape arrangement instead of facing each other across the room. Back to the original layout, a miniature storage cabinet stands beside the small pink stool. 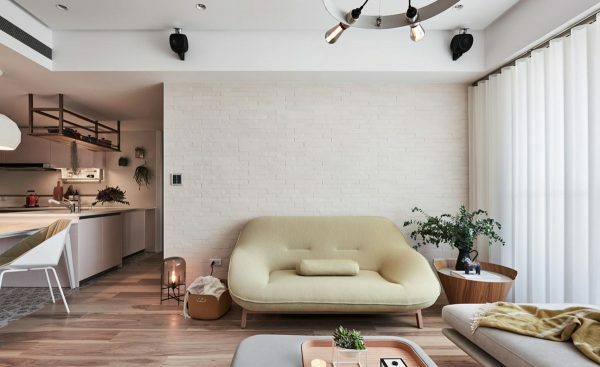 There is no artwork on the walls of this living room. 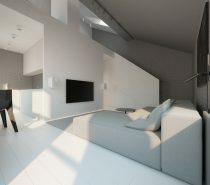 The subtle colours that are infused into the scheme via the furniture upholstery provides all of the visual interest. 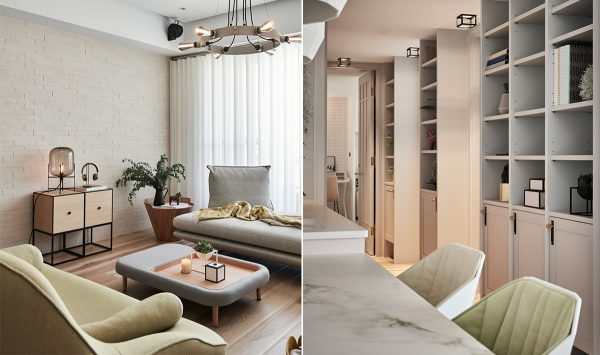 A cosy throw on the light grey bench seat ties in with the hue of the sofa, and one of the dining chairs that is situated in the open plan living space. On the tiny wood console unit, there is a cool headphone stand and a designer table lamp with black frame that matches that of the unit. The lamp you see here is the Oda style lamp, you can get the replica here. 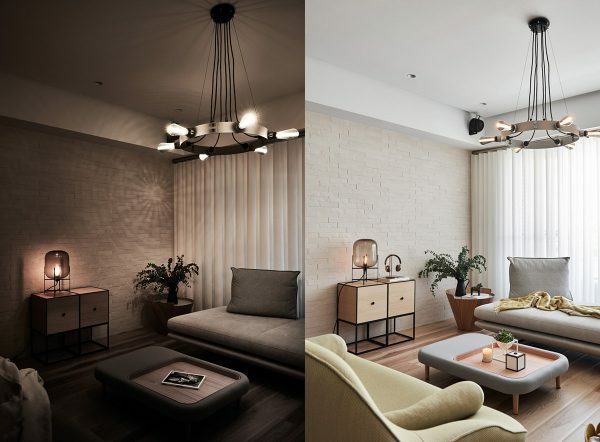 By night the lighting scheme provides a warm and cosy atmosphere in the living room, perfect for relaxing evenings in front of the television or iPad, or listening to music and podcasts on those headphones. 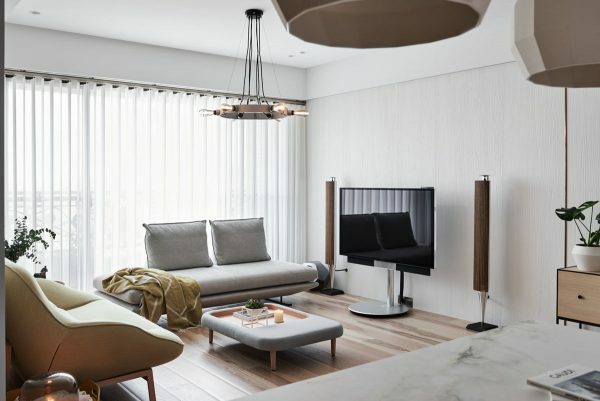 The central pendant is industrial style lighting with a brushed silver finish. 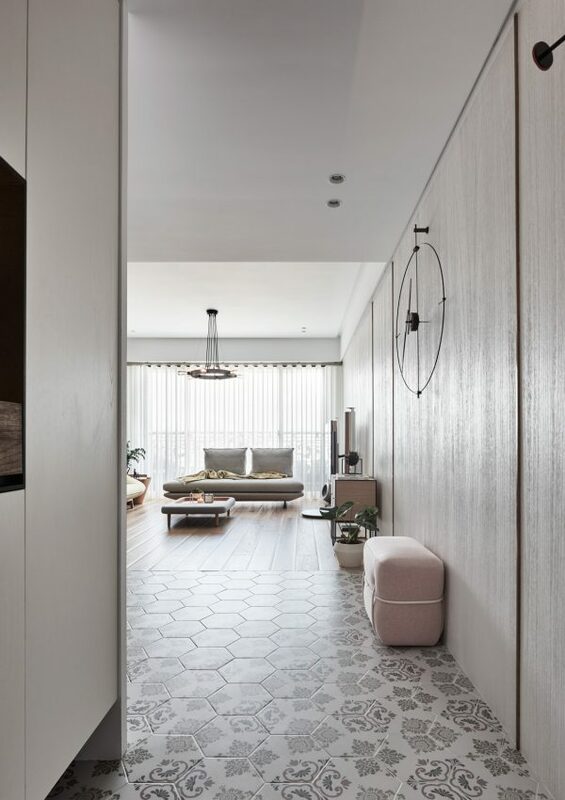 Leading into the open plan home from the entryway, stunning patterned tiling with a geometric cut covers the floor. This installation continues over the kitchen and dining area but ends towards the living room where it is superseded by wood plank flooring. 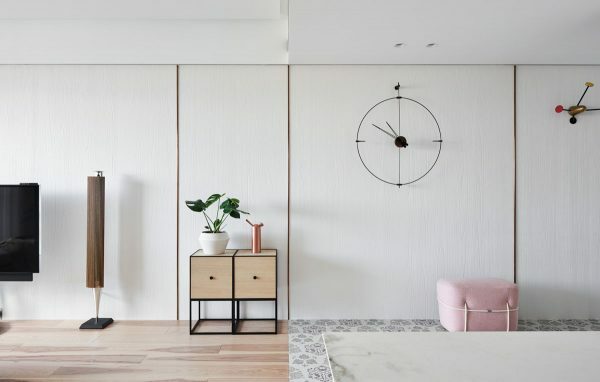 Opposite the kitchen-dining area there is a large wall clock that is held a couple of inches off the wall by its mount. 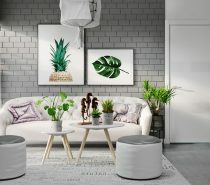 A number of indoor plants are dotted around the home, the first being this large and leafy Swiss cheese plant nearby the front door. The kitchen diner is a spacious area with plenty of cabinet storage and preparation area. The dining suite seats four people. 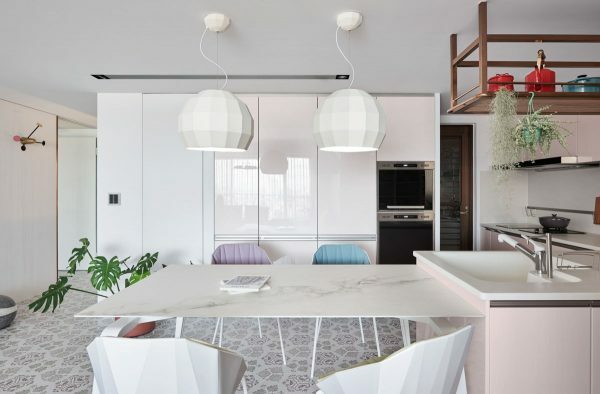 Two white dining pendant lights illuminate the marble effect tabletop, which is teamed with a set of geometric cut modern dining chairs that each have different contrasting coloured cushioning. There is a floral arrangement on the dining table that brings together all of the colours of the four upholstered seats. 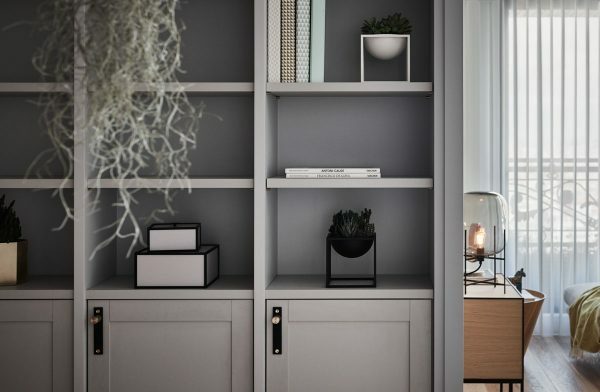 Running along the wall opposite the kitchen, on the way to the bedroom and home office, tall grey cabinetry offers a bank of lower cupboards for concealed storage and a selection of exposed shelves on which to store books and display decorative items like this unique plant stand. 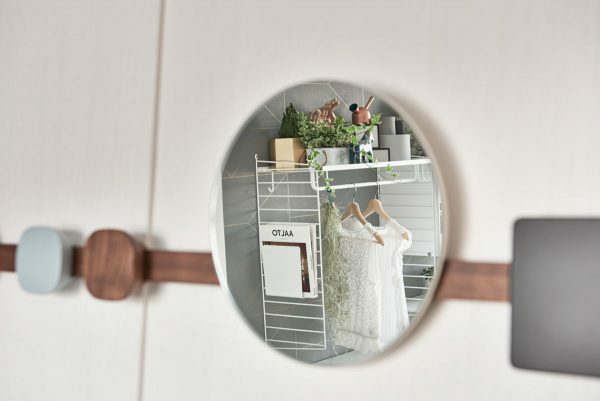 Leading into the bedroom, a small wall rack is fitted with decorative hooks and a convenient face mirror for a last minute out-the-door appearance check. 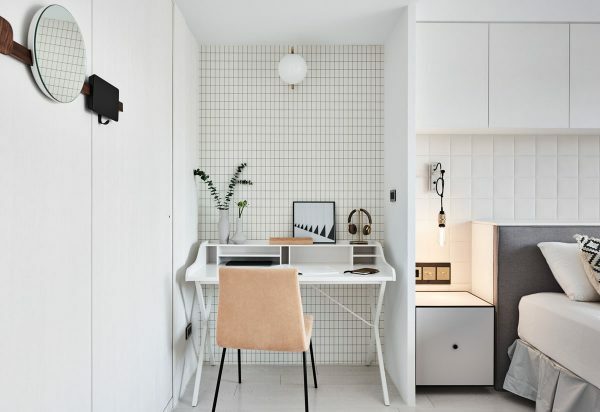 The home office is situated in the bedroom, separated only partially by a narrow dividing wall. 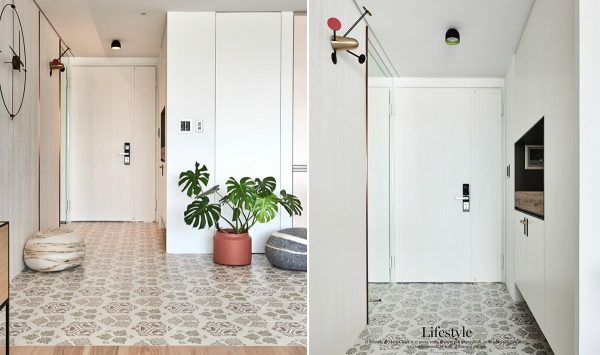 Interior sliding glazed doors to the left lead off into a generously sized walk-in closet. The white desk is teamed with a buff camel coloured stylish desk chair and a duo of stony grey decorative vases. 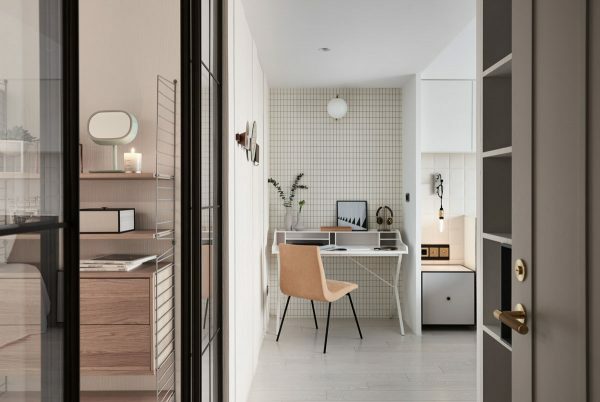 Behind both the study area and the headboard there are chequered designs of varying proportions. 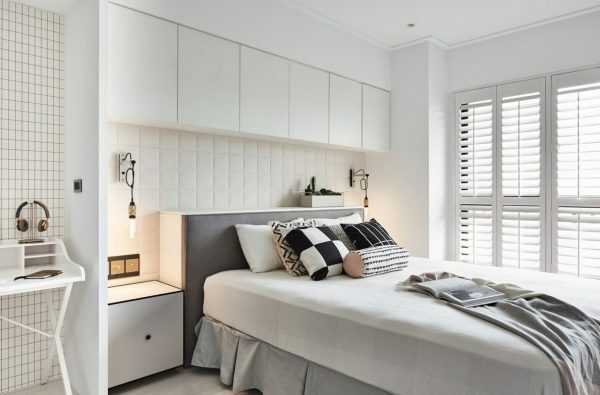 Shallow wall cupboards are nestled flush beneath a soffit above the bed. 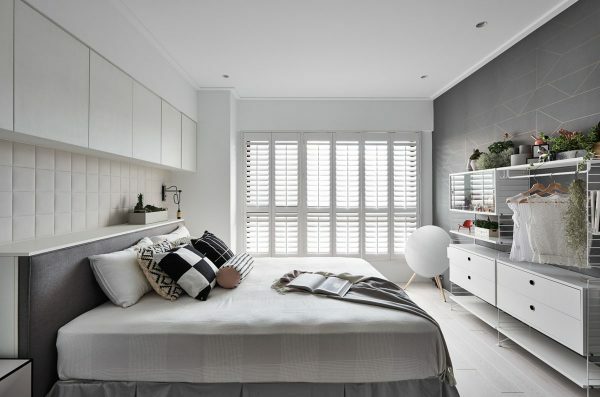 White shutters give the window a clean unfussy finish. 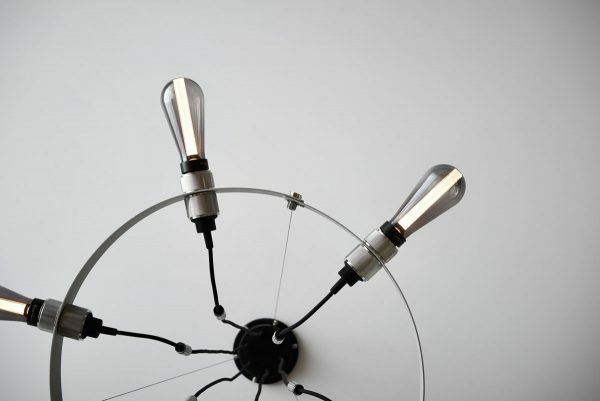 Wall sconces at each side of the bed have an industrial style, showcasing looped wires and exposed bulbs. 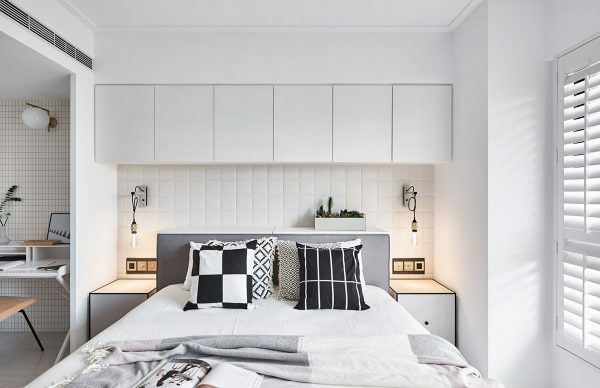 The bed is dressed with bold monochrome print cushions. 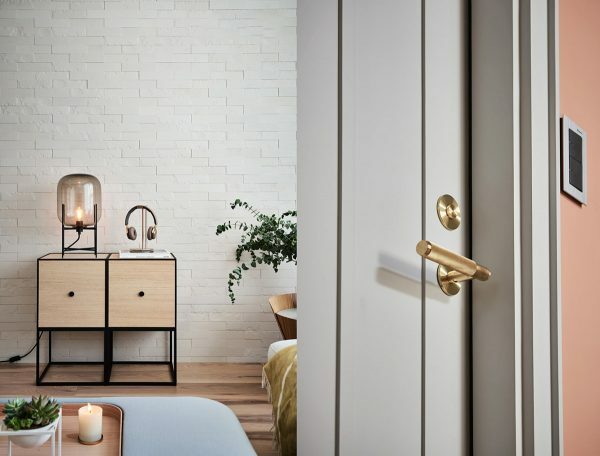 The fixtures in the bedroom have been selected in a fashionable gold finish teamed black detailing. 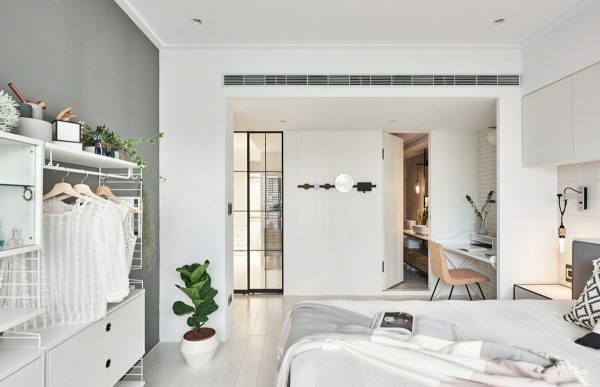 Despite the presence of a walk-in closet, the bedroom also has an exposed garment hanging rail for a few current favourites. 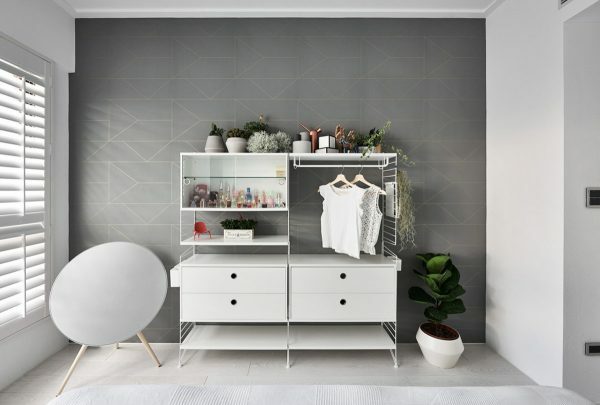 Concrete planters decorate the top of the exposed closet system, which also has a glass fronted display cabinet that is reserved for pretty perfume bottles. 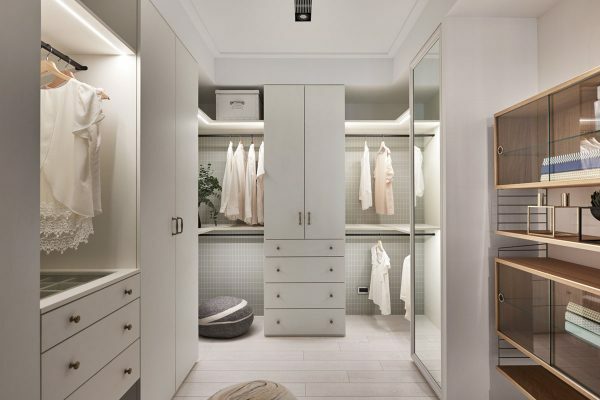 Inside the large closet there is another wall hung cabinet in which to store smalls and toiletries. 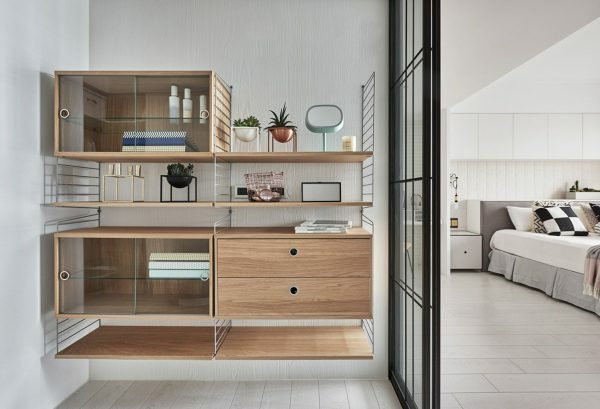 The remainder of the closet is kitted out with exposed hanging rails that are individually lit with LED lighting strips, plus a selection of concealed hanging spaces and drawers. 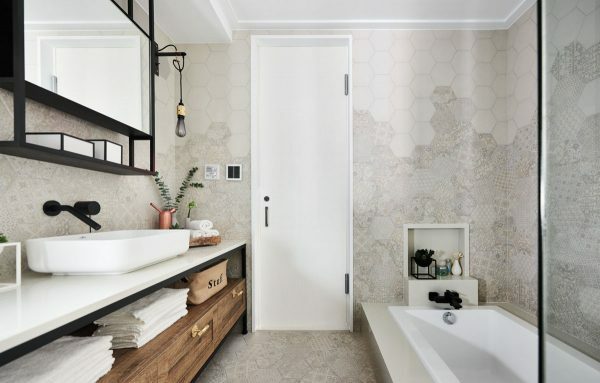 The ensuite bathroom has another beautiful geometric tile arrangement – though different from the design used out in the kitchen-diner. 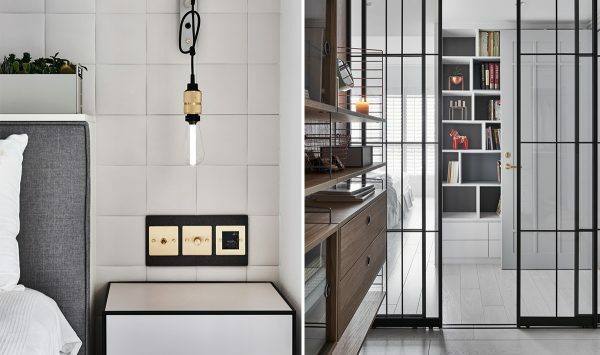 More jet black trimmings are used in this light space too, including a matte black faucet. 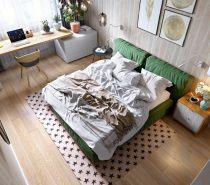 The child’s bedroom in this house is awash with calming soft turquoise. 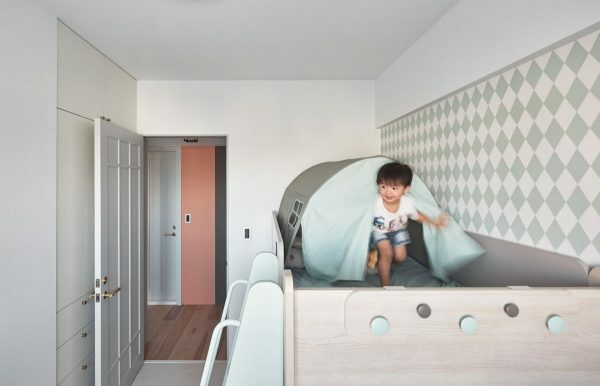 A fun tent canopy sits atop the kids’ bed. 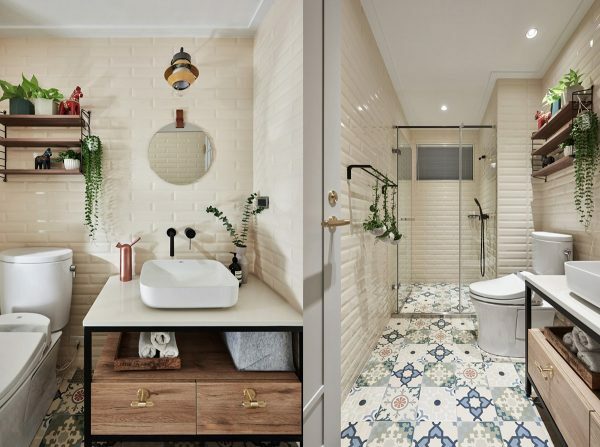 In the smaller bathroom we find more elegant tiling and another warm wood vanity.